Rhodes is a great suburb to get out and about with shopping at the Rhodes Waterside Centre, playing in the foreshore parks or cycling around the bay. But when you choose to leave your premises you want to know that your home is safe and secure every time you shut your front door. When you lock it up with your Rhodes locksmith you can be sure of your security. 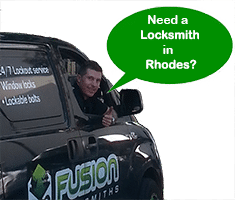 Fusion Locksmiths are available around the clock to assess and recommend better locks and systems to suit your home based on your way of living. From unsticking of a lock to installing a restricted keying systems we have specialised services to suit your needs. Have you accidentally locked yourself out of the house? Call Fusion Locksmiths now so we can arrive quickly to fix your lock and security problems. All our locksmiths are fully licensed and trained so you know you are getting the best in Sydney locksmiths. Modern technology and new developments in security have changed the lock and security industry for the better. Easier to use systems are available for stronger security. Protect your family and valuables in your home while you are not there. Fusion Locksmiths can install keyless locks so you can lose those keys for good. We have back to base security alarms for extra protection for all hours of the day and night. Call us any time 24/7 for fast and knowledgeable security service, with a smile too. We promise to pick up the phone in the dead of the night and can be there within the hour, often much sooner. Best of all, we will be there when we say we will. Whether you have been locked out of the house, lost your keys or have no idea what happened after a break-in, we’ll be there to get you back safe and secure. All our locksmiths have arrive in fully equipped trucks, with everything to fix, install or advise you on your security issues. From safes to deadlocks, to back to base security systems and intercoms, we can provide solutions to suit your requirements.